Our Pukekohe Chiropractors will make you feel right at home. Our goal at Chiropractic Edge is to help you feel right at home from the moment you walk through our doors. Most importantly, we want you to feel like you are in the right place. What we’ve found is that one of the best ways to eliminate apprehension and offer people the best possible experience, is to explain everything in advance, no surprises! The more you understand what we offer and how we can help you, the better the results you’ll enjoy. We want to get to know what’s important to you, so we can provide the solutions best suited to those needs. Your first visit to our office is all about gathering information to determine how best chiropractic can help you. You’ll need to allow about 45 minutes for this appointment. You’ll complete some paperwork, meet with your Chiropractor and discuss your concerns and needs. Your chiropractor will then guide you through a thorough examination including orthopaedic, neurological and chiropractic tests. Depending on the results of your history and examination, x-rays may be necessary. Your chiropractor will then walk you to our front line team who will help you make your next appointment. In this visit your chiropractor will have studied all the information gathered at your first visit and make recommendations based on helping you achieve the best possible results in the shortest and most cost effective way. At this visit you’ll begin the first phase of your chiropractic adjustments, which are designed to restore proper function to your spine and reduce nervous system pressure, allowing your body to heal and function effectively, just as it was designed to do. Again everything will be explained for you in advance to make sure you fully understand the process. You’ll need to allow up to 25 minutes for this appointment. 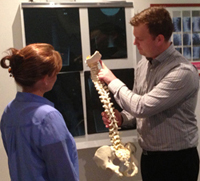 At Pukekohe we help make sure you understand your Chiropractic care. With the ground work laid and the plan set, the exciting part begins. Your chiropractor will assess your spine and nervous system at each regular visit, make adjustments to help your body restore proper function and you’ll be on your way. We understand that your time is important, so we will do everything possible to run on time and minimize the impact on your busy life. Just like regular workouts at the gym, or exercise, each session builds on the next to restore and strengthen your spine and nervous system function. The most important thing you can do for yourself is to make sure you keep your appointment schedule. Missing a visit can cost you in a number of ways as you may lose the momentum necessary to enjoy the changes needed. Our frontline team will be there to help you every step of the way. Your future health is just a phone call away. Contact Chiropractic Edge and get started today!